India celebrates 150 years of Rabindranath Tagore. I met him for the first time sometime in the mid 1960s. I had accompanied my father to Sri Sadagopan’s house in Delhi. I was maybe 7 years old. And he was singing a small tukda, a bit of a carnatic alapana. And being drawn to music, I just sang that right back, imitating him, and he set his eyes on me, and his face flowered into a most delightful smile. I was inducted there and then. He was at that time in the midst of composing songs for children in Tamil and Hindi – and in me, he found a member for his troupe. I vaguely knew that he was a Professor of music in Delhi University, and brought out a magazine called the “Indian Music Journal” (Postman always brought magic those days).. I had no idea that he was a very famous actor in his earlier days… To me, he was a mystic straight out of our mythology – Ramayana or Bharata or Bhagavatam, some person who belonged to the world of Narada and Tumburu. Oh yes, to me he was a Rshi, his eyes always sparkling with divine radiance, his smile displaying complete joy, and his enthusiasm boundless… He was my first Master. He was usually dressed in a white jibba-pancakacham, and drove a black (or was it dark blue) Landmaster car. In his jibba pocket were a pair of chaplakattai. And he was always bubbling with music. I remember a day when we were in Pandara Road, he came in, whipped out his chaplakattai and sang his new song Dimikki-dimikki, his face blooming in mischievous joy! Sri Sadagopan is the lead artiste. Lalgudi Jayaraman is accompanying him on the violin. The Mridangam was played by an artiste who was visually impaired. 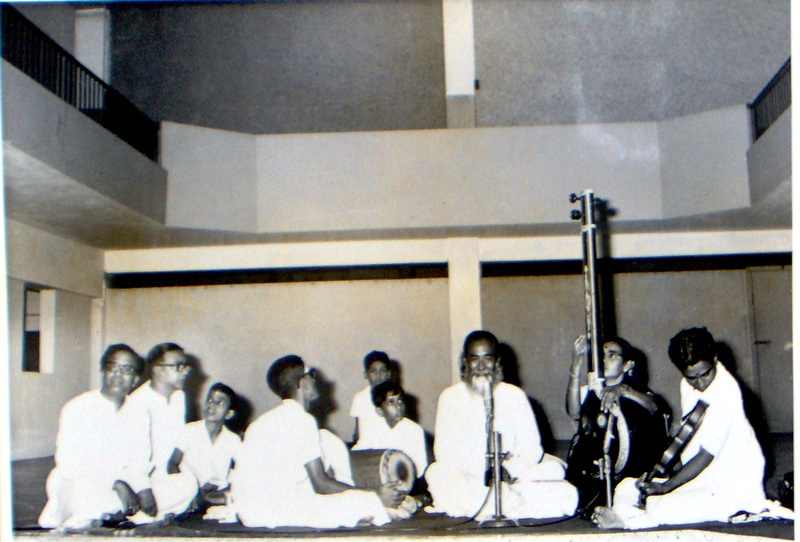 The kid seen behind the mridangam, sitting next to Sri Sadagopan and looking at him, is yours truly… This picture is from1970. A decade or so later, I came to know that Sri Sadagopan had disappeared. Gotten off a train and walked away. Never traced. Rumors had it that he had renounced all, taken a life of Sanyas… I do not know about that. But this I know. He danced to the tune of a different drummer. And that drummer was God. This entry was posted on May 9, 2010 at 5:57 am and is filed under Culture notes. You can follow any responses to this entry through the RSS 2.0 feed. Both comments and pings are currently closed. Although I do not know about this Malathi enjoyed your write up and knows a lot about him. Something else I saw in Hindu archives. I remember reading one more article on VVS by MS Swaminathan (former DG of ICAR) – that had more reminiscences of VVS in Delhi. In fact the article refers to kids in Bharti Nagar. This should inspire you to search for that article and post it. > And he was singing a small tukda, a bit of a carnatic alapana. “He was at that time in the midst of composing songs for children in Tamil and Hindi” – Kameshji, any idea, if his Hindi compositions are available in any music format (Cassettes, CDs, MP3 etc)? Thanks a ton for this wonderful post :D.
I listened ‘Anand Ho’ and resist myself the link my blog.. Thanks a ton, Sriniji and Kameshji :D.
Didnt knew about this man though..Nice to know about him. The pic looks really old.Thanks..